une 23rd marks the 10th anniversary of The Rotary Club of Chilliwack’s Garden and Lifestyle Tour. 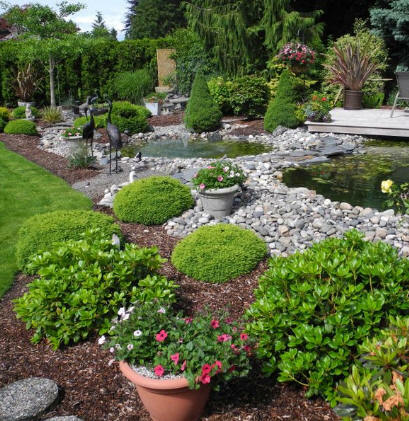 This year features 10 gardens in the Chilliwack/Rosedale area where homeowners have combined their lifestyle into their gardens. Bruce Coleman has had a lifelong passion for model trains and his wife, Monica loves gardening. Together with their son Chris, they have turned a regular sized city lot into a fantasy land. Bruce has approximately 16 locomotives and 90 cars. 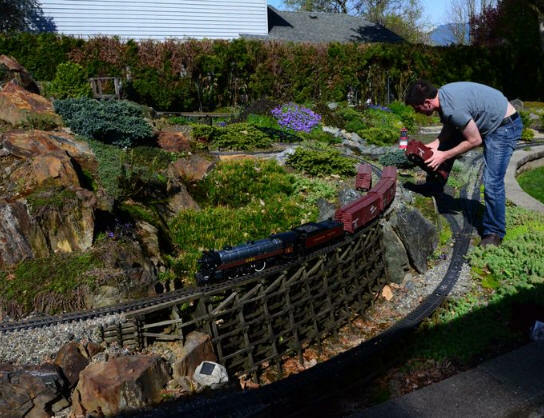 Trains run throughout the garden, going past miniature mountains, and ravines and over trestle bridges. The whole landscape is planted with dwarf varieties of many species, and although Monica now has M.S., she is still able to handle some of the weeding while using her walker. Larry & Karola Stinson’s heritage home sits on an 8-acre property, close to the Rotary Great Blue Heron Reserve. They love to live outdoors as much as possible, and their property reflects this lifestyle. Their English country garden blooms from Spring to Fall, with many varieties of clematis, roses and other perennials, which can be admired while sitting under the arbour. Larry too loves model trains, and will be running 4 trains inside the barn, and two trains around the gardens. Ticket holders will also be able to view doves, pheasants, fantail pigeons and other birds, and horses. Larry and Karola let equestrian events be held on their property, which is often used by the Cheam Vaulters (gymnastics on horseback). It’s possible the vaulters will be there during Tour day. Ada van Reeuwyk has a very busy life as a school-teacher. To achieve balance in her life, Ada created the serenity of an alpine meadow in her garden, which features four ponds with waterfalls. Plants include New Zealand flax, various grasses, hostas, rhodos, etc. Interest is created through the use of multi-level plantings, transforming this city lot into an oasis of peace and colour. Ada did all the work herself, and can now enjoy a tranquil lifestyle in her garden. This is the first year in the history of the Tour, that a First Nations garden is being featured. Chief Willi Hall and his wife, Lisa, have an extremely busy life with band duties, as well as raising children. 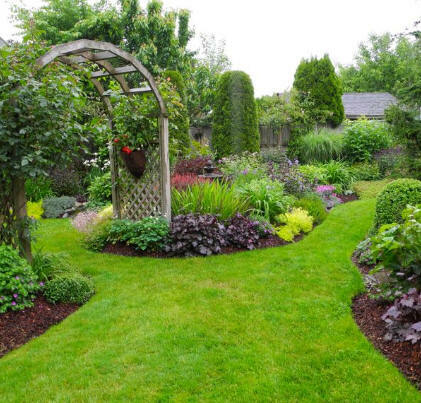 Lisa, who is an avid gardener, has created several distinct areas in her garden to capture all their many lifestyle interests. There is a large vegetable garden, a multi-deck pool area showcasing outdoor living, a fire pit with individually cut stones, and beautiful arrangements of annuals and perennials throughout the property. There is also a very interesting irrigation watering system. Willi and Lisa believe in the children helping in the garden, and each child is responsible for weeding and maintaining part of the long driveway. Lisa said her mother, who lives in the Okanagan, always used to win gardening prizes, and has passed her love of gardening onto her daughter and grandchildren. Ernie and Maria Charlton call their place a lazy time hobby farmstead. Ticket holders can take a slow ride down the driveway and view many of the mature trees on the property, including six specimens of fir, 3 species of spruce, 5 species of maple and many other types of tree, many of them identified with labels. Sit by the lovely meandering creek and enjoy the pastoral nature of this property. Ernie enjoys collecting antique farm machinery including a 1914 Robert Bell Steam Engine. These antiques are placed throughout the property which gives added interest. Another home and garden that features antiques belongs to Henry & Grace Kikkert. 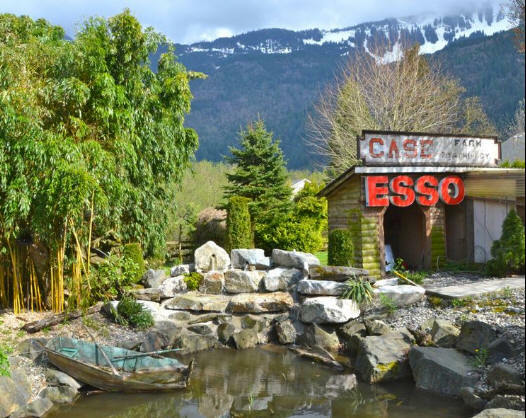 The extensive garden has large cedars, rhododendrons, yuccas, hostas, lupins, iris, ponds, and waterfalls with majestic Mt. Cheam forming the backdrop. Henry has been collecting antique car memorabilia for over 30 years, and has been featured on the Canadian Pickers TV program. After touring the garden, visitors will be able to view rooms full of miniature antique cars. These are only some of the ten homes featured on this year’s tour. Recently, the club gave $32,000 in scholarships to local students, has given over $100,000 to Chilliwack Hospital and the Chilliwack Arts Centre, and supports with money and labour the efforts to eliminate polio throughout the world. Tickets are $20 each and sale locations are listed at www.chilliwackrotarygardentour.ca. Each ticket will also allow free admission to the world famous Minter Gardens on Sunday June 24th (value is $17). 100% of the monies collected help the Rotary Club of Chilliwack with their many humanitarian fundraising activities.